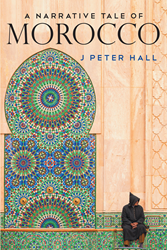 Recent release “A Narrative Tale of Morocco” from Page Publishing author J. Peter Hall is a captivating look at his adventures as a tourist at the different places in Morocco, adding historical facts and photographs of the sites, monuments, people, and anything insightful about the country in every feature. J. Peter Hall has completed his new book “A Narrative Tale of Morocco”: an amusing account of the author’s wonderful findings of colorful beauty and history in Morocco, a country where he has traveled with an eagerness to learn last 2013. Published by New York City-based Page Publishing, J. Peter Hall’s fascinating narrative is a unique travel write-up compared to the usual travel blog posts online; the author incorporates historical facts to further explain the places and culture in Morocco, including its religious and political aspects. Readers who wish to experience this insightful work can purchase “A Narrative Tale of Morocco” at bookstores everywhere, or online at the Apple iTunes store, Amazon, Google Play, Kobo or Barnes and Noble.